When it comes to campfire cooking, cast iron is one of the most popular tools used by campers. While dutch ovens are often the top choice due to their versatility, other cast iron pans, such as a skillet, are also handy to have. First things first. How you care for and clean your cast iron is almost as important as how you cook with it. Here are some things to keep in mind after you dig out your old dutch oven or go out and buy a new one. Don’t use harsh cleaners or detergent for cleaning, instead use a very mild soap or plain hot water. (Contrary to popular belief, a little bit of mild soap will not strip the seasoning off) If there’s food stuck on the pan, use a stiff brush to remove it. Drying is extremely important. You will want to dry your pan immediately after washing with a lint free towel. Cast iron doesn’t rust easily, but it will eventually rust like anything else if it’s exposed to water for long periods of time. Don’t forget to re-season! You don’t need to do this after every use, but it’s a good idea to occasionally prime your cast iron. To do this, rub your pan with a small amount of oil – think canola, vegetable, or corn – wipe it dry so the pan basically looks untouched and then place it over heat for a couple of minutes. Store cast iron in a clean, dry place. Dutch Ovens are great for campfire cooking because you can cook up a complete meal in one pot. 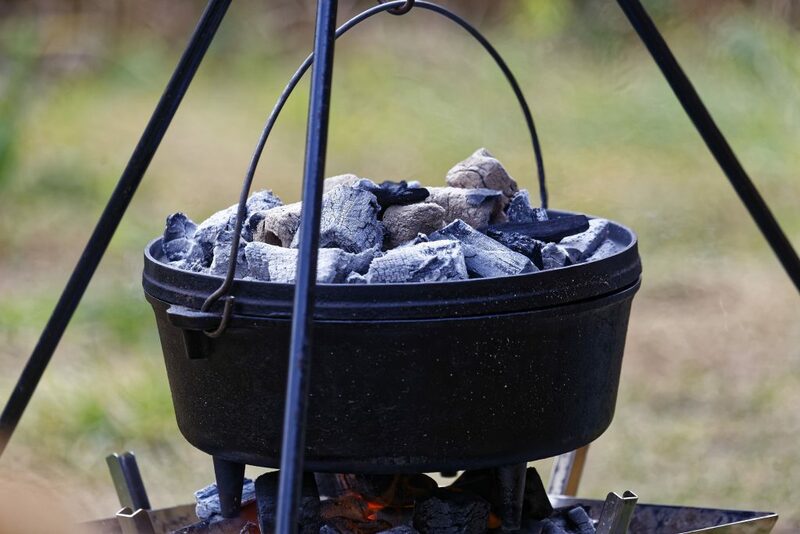 Many dutch ovens have legs so you can place them directly over the coals or if you’d prefer, you can use a tripod and hang them over the fire. Cast iron takes a bit to heat up, but it retains and distributes heat extremely well. Cooking time often depends on weather so plan accordingly. This method of cooking is more hands off giving you plenty of time to do other things around camp. To avoid heating the ground instead of your food, place some kind of fireproof barrier between your coals and the ground (like an old cookie sheet). Don’t forget to rotate your oven during cooking! Periodically turn the oven and the lid in opposite directions – and remember to bring either a lid-lifting tool or heat-resistant gloves! If you know that something has a longer cook time, be prepared to add more coals so you aren’t scrambling at the last minute and losing precious heat. Remove ashes as you cook, they reduce heat. Whisk brooms work well for this. Keep the lid on! You want the heat and steam to stay inside the oven so don’t take the lid off unless it’s absolutely necessary! Now that your dutch oven is clean, seasoned and ready to go, here are a few simple recipes to get you started. Nothing warms you up on a cool night like a delicious bowl of chili! This rich, hearty meal brought to you by Camping For Foodies is filling and great for winter camping. Want to speed up the process? Measure out the ingredients at home for easy adding. Check out the recipe here. Who doesn’t love sitting down with a plate of nachos and a beer after a long day of adventuring? This tasty meal by Fresh Off The Grid is fast, easy, and a crowd pleaser. Get the recipe here. Now that you’re ready to try out your cast iron cooking skills, it’s time to find your next camping destination! Explore thousands of campgrounds, RV parks, and cabins across the US on Camp Native. Whether you’re looking for a primitive campsite, a cozy glamping yurt, or a cabin big enough for the entire family, you’ll find it on Camp Native! Explore campgrounds.